Surrounded by ocean and nature, this family-friendly resort in Punta Cana offers the perfect vacation on a palm-studded beach. The resort offers 502 suites with luxurious amenities and a Jacuzzi on every suite's furnished terrace or balcony. Enjoy gourmet dining and unlimited beverages at nine restaurants and six bars. In addition to a world-class spa, the resort features 16 swimming pools and plenty of activities and entertainment for everyone. 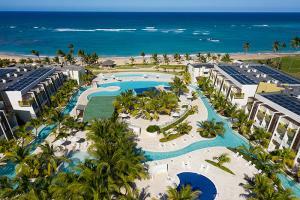 Located on the Dominican Republic’s northeastern coast.